Advertising on Auto Rickshaw across north India is a prominent way to grab the attention of your targeted audience towards your brand. Auto Rickshaw Branding or Auto Branding delivers you an impeccable Brand Recall and offers wide reach by covering almost the entire city. Auto Rickshaws’ Advertising across North India provides you an effective yet affordable outdoor advertising medium to target people of all age groups. 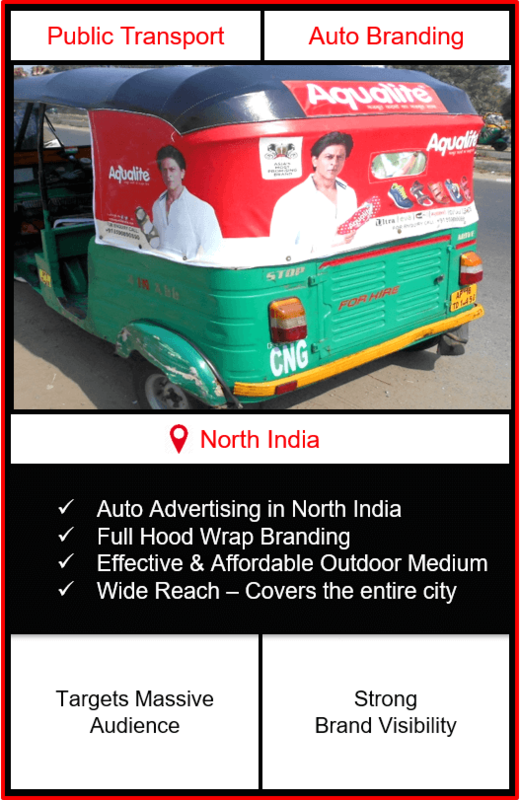 This transit medium of advertising on Autos makes sure that your brand’s ad gets maximum exposure in a cost-effective manner. Branding on Auto rickshaw not only offers your brand a wide reach but it also ensures you a Strong Brand Visibility. Autos Advertising stand out in prime locations where there is more frequency of people, this lets your Auto Rickshaw Advertisement Campaign to boost up the brand’s engagement rate. Branding on Auto Rickshaws ensures that your brand message is conveyed to the people, whether they are travelers or pedestrians. Hence, providing your brand’s advertisement to have Negligible Ad Avoidance. 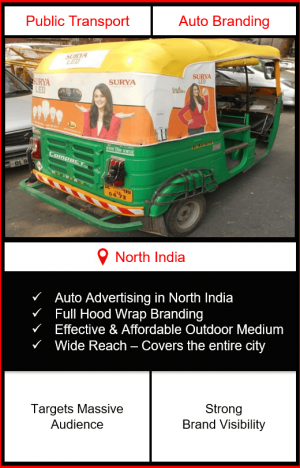 You can advertise your brand on autos across north India comprising of different states like Uttar Pradesh, Delhi (covering Delhi NCR), Chandigarh, Haryana, Himachal Pradesh, Uttrakhand, Jammu & Kashmir and many more. Apart from this, You can also choose the state and cities in which your brand has a targeted audience. Haldwani & Other Cities As Well. Udhampur & So Many Other Cities As Well. 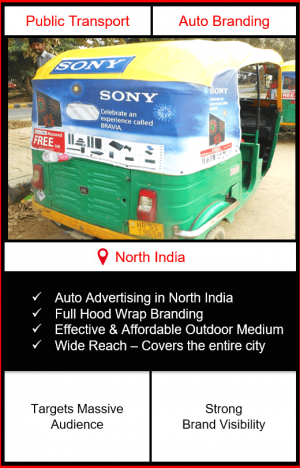 Big Media Kart is the leading Auto Advertising Agency providing the best of auto rickshaw advertising services across PAN India at affordable prices. Branded Auto Images will be shared only once in the campaign. Complete branded autos images with their number plate or registration number will be shared after execution. 100% Advance payment to be released in favor of “Redzo Media Solutions Private Limited”. The Design has to be shared in the CDR format. The availability depends at the time of booking. Artwork/creative to be provided by the client itself. GST @ 18% is extra.